Sweet potato in my pie, pumpkin in my pancakes? That’s right, green vegetables are giving way to orange, as evidenced by the piles of winter squash on my counters. Luckily, orange is a very popular vegetable color around here. Especially when the vegetables come in the form of pancakes. Or pie. 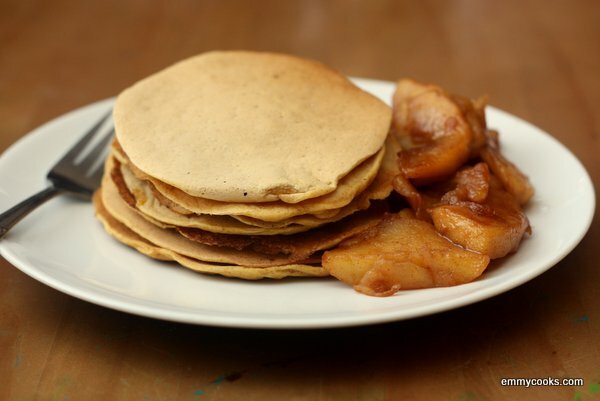 As we’ve established before, vegan pancakes are nothing to be afraid of. Instead of relying on yeast or eggs to rise, these use baking powder. They’re sturdy, sweet, and satisfying. And like all pancakes, the leftovers make the most popular PB&Js my kids have ever known. Vegan Pumpkin Pancakes (serves 2-4, doubles easily): In a large bowl, mix 1 1/4 c. flour (I used part whole wheat), 2 Tbsp. sugar, 2 tsp. baking powder, and 1/2 tsp. salt (optional: add a few shakes of cinnamon and a pinch of nutmeg, or your favorite pumpkin pie spices). In a separate bowl, whisk 1/2 c. pumpkin puree with 1 1/2 c. non-dairy milk or water (I used a combination of almond milk and water). When the wet ingredients are smooth, stir gently into the dry ingredients just to combine. Ladle 2 Tbsp. batter at a time onto an oiled griddle, spreading slightly if necessary to form a thin pancake. Bake over medium heat until bubbles form throughout the pancake, then flip and brown the second side. Serve with your favorite toppings. This entry was posted in Breakfast, DIY, Easily Multiplies to Feed a Crowd, Food, Recipes, Vegan or Would-Be-Just-As-Good-Vegan and tagged breakfast, orange vegetables, panckaes, pumpkin, vegan on November 17, 2012 by emmycooks. These sound good and I bet they make the kitchen smell like pumpkin pie (one of my favourite things)! Yum! It is pancake weather…and pumpkin pancakes sound great! Sandwiches out of leftover pancakes? Brilliant! I have a bit of puréed pumpkin left over from another recipe and now I know how I’m going to use it. These pancakes look great! What a great recipe!! I’m going to be so sad when the pumpkin recipes slow down after Thanksgiving! PB&J on leftover pancakes?! I’ve never heard of such decadence. :) Nice! Love pumpkin pancakes – and like you – am finding pumpkin getting into lots of my recipes these days! Okay. My husband has been dutifully making the kids pancakes and crepes on Saturdays even though he’s no longer eating them himself. Time to give these a try so we can all partake. Plus, pumpkin!! I think you made these just for me! I love the thinness Emmy! I made pumpkin pancakes recently too…so delicious! They were good–but now I want to try your pumpkin Mac & Cheese recipe!